This is a safe and effective repellent for many common garden pests. Garlic is chock full of natural compounds that repel or kill many insects that threaten flowering plants and garden foliage. Each clove contains diallyl trisulfide and diallyl disulfide, which are potent but organic solutions to whiteflies, hungry beetles or aphids, among other hungry insects. How to make it and instructions for use: Start with a sealable jar and then add 2 teaspoons of mineral oil to 3 garlic cloves. Allow the mixture to stand for 6-8 hours and separate the garlic cloves from the oil. Be careful to not let too much oil pour out during the process, as this will affect the potency. Pour the contents into a spray bottle and dilute with 1 pint of water. 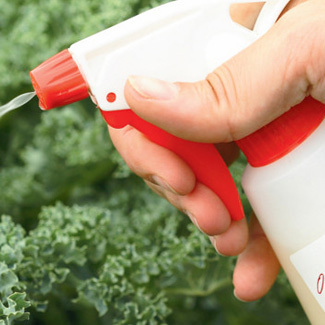 Then simply add 1 teaspoon of dish soap (biodegradable) and you’re ready to spray away hungry garden or plant pests! The dish soap acts as a sticky agent that keeps the spray on plant leaves for a longer time. Do not apply your garlic plant spray during peak sun hours. The sunlight can cause plants to burn when coated with mineral oil. This can be challenging given the sunny climate of Phoenix. Instead, opt for sundown or evening hours to spray your flowers, plants or vegetable gardens. Spray the leafy areas of your foliage just once and from a distance of 6 inches or so. The chili pepper sauce, Sriracha, is a favorite for spicy food lovers. The spicy qualities of peppers can also be used for organic pest control on plants and gardens. Peppers contain capsaicin, an organic compound that irritates almost all insects. Aphids, beetles, whiteflies, mites and even rodents would all rather flee than munch on leafy plants with this pepper bug spray. Word of caution: Consider pets and children who may play near gardens or plants. Make sure to allow 6 hours before letting kids play near these areas. Avoid over spraying onto garden products or accessories that can be licked by dogs. How to make it and use it: Using a spray bottle, add 2-3 drops of dish soap(biodegradable) to two teaspoons of hot pepper sauce and 1 quart of water. Allow to sit for 6-8 hours before use. Spray leaves and problem areas from about 6 inches away. No, this isnt’ a derogatory term or a fancy drink. However, it is an effective mixture that rids your foliage of harmful slugs. The yeast in beer is what attracts slugs to a simple container that is sunk just beneath the garden soil. How to make it and use it: A cat food or tuna can is the perfect container. Start by pouring the beer to just below the top line. Simply bury the container to where the beer is about an inch below the soil’s surface. You will likely see results within a day or so. Please keep children and pets away from the area during this period. You can enjoy beautiful foliage year round with these organic bug killers for plants. The Green Goddess is happy to suggest more ideas on plant care and garden maintenance. Please contact us or come by our Phoenix nursery.